When discussing reactions to pre-slaughter handling, we should first consider the sensory capacity of the pig. It has been suggested that pigs are stressed by witnessing the slaughter of other pigs but an investigation has shown that this had no stressful effect. Pigs have good hearing - better than humans, at high frequencies. Loud and novel noise can be stressful to pigs but there are individual differences. A major aspect of the high noise level in a slaughter facility is the squealing of pigs; this is also indicative of stress. The sound of clanging metal can cause baulking and agitation, so the fitting of rubber stops on gates and the edges of other interior devices will help reduce noise. High slaughter speed is associated with high levels of both noise and stress. Improved handling procedures will decrease noise. Ears of a piglet. Photo: Jens Tonnesen. Pigs have wide, monocular field vision, but they have poor short-range vision and it is suggested that there may be an extensive blind area at ground level. Therefore, in order to judge depth on the ground, pigs have to stop and lower their heads. As a result they are likely to confuse floor irregularities and shadows with actual physical barriers. Pigs, like other animals, have a tendency to move towards a more brightly lit area. This observation has led to the use of even and diffuse light in pig corridors in many abattoirs. 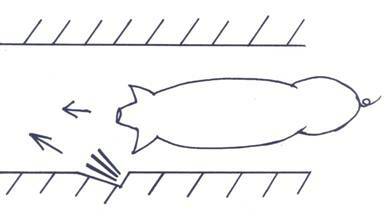 Schematic representation of use of light in corridors to direct pigs. Drawing: Neville Gregory. Pigs have a good sense of smell but this sensory capacity has not been very well investigated. The snout seems to be much more important for rooting at floor level and for probing walls and other objects in the pig's surroundings, as well as flockmates and stockpeople. Snout of a pig. Photo: Anne Algers.